Shim-pack MAqC-ODS I reversed-phase columns are packed with a silica gel containing metal and added octadecylsilyl group. In addition to the hydrophobic characteristics of the ODS, the metal content also provides cation-exchange effects. This increases the retention of basic compounds. Therefore, this allows use with only a buffer solution as the mobile phase for analyses that previously required using an ion pair reagent and enables using gradient elution. These characteristics are especially beneficial for analyzing water soluble vitamins and pharmaceuticals that contain a large amount of basic compounds. Water soluble vitamins contain many highly polar basic components, which are known to exhibit weak retention in the reverse-phase mode. Consequently, with typical ODS columns, such as the Shim-pack VP-ODS, an ion pair reagent is added to the mobile phase for analysis. However, using an ion pair reagent makes gradient elution difficult, resulting in peak broadening for components that take longer to elute and making it difficult to improve sensitivity. In addition, the effort required to prepare the mobile phases and condition the column is also an issue. 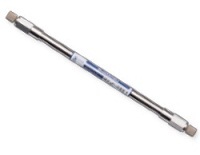 However, because the Shim-pack MAqC-ODS I enables using gradient elution, it can shorten analysis times and result in sharp peaks even for components that elute slowly. 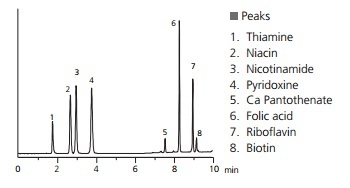 For example, riboflavin, which elutes as the final peak with a typical ODS column, is detected with approx. 2.3 times higher sensitivity by the Shim-pack MAqC-ODS I. Many pharmaceuticals are basic compounds. The majority of impurities in pharmaceuticals, such as unreacted ingredients, by-products, and decomposition products, are highly polar basic substances. 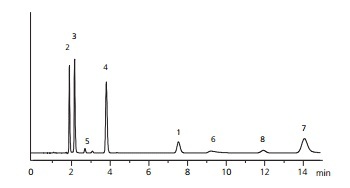 Consequently, analyzing impurity peaks using LC/MS can be difficult if a non-volatile ion pair reagent is contained. In the following example of analyzing famotidine, using a Co-Sense for LC/MS automatic pretreatment system, to desalt the mobile phase used with the Shim-pack MAqC-ODS I column enabled analysis by LC/MS. While a typical ODS column (Shim-pack VP-ODS) detects 12 types of impurities, the Shim-pack MAqC-ODS Ⅰ detects 20 types of impurities due to separation specificity and gradient elution. 2 g of sodium 1-heptanesulfonate was dissolved in 900 mL of water and acetic acid(100) was added to produce a pH of 3.0. Then water was added to make 1000 mL. 240 mL of acetonitrile and 40 mL of methanol were added to this solution. Gradient elution with a Shim-pack MAqC-ODS I column was used for simultaneous analysis of components contained in an over-the-counter commercial cold remedy. The ability to use gradient elution enables the acquisition of sharp peaks, even for components that eluted slowly, similar to the water soluble vitamin and drug impurity examples above. 1) To increase the retention of basic compounds, please use a buffer solution within the pH 2 to 4 range. 2) In the case of a basic substance tailing, it may be possible to improve the peak shape by increasing the salt concentration of a buffer solution. 3) The elution of basic compounds is faster by increasing the salt concentration, and it is possible to adjust retention by salt concentration. This product developed by collaboration with Eisai Co., Ltd.